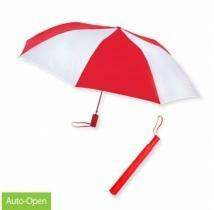 Compact, manual umbrella opens and closes easily with slide and release button. 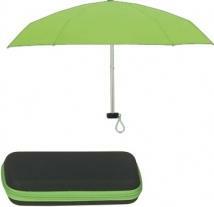 Lightweight design allows umbrella to fit into your carry-on, purse or briefcase. Rugged poly-pongee fabric for protection from the elements. 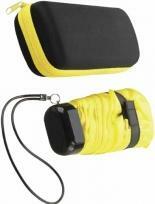 Durable carrying case. Size: 3"w x 7"h (opens to 39"w). Auto open Steel frame Plastic handle Matching sleeve Dimensions: Folded Length: 15� Arc: 42� includes 1 color, 1 panel Base prices are listed. Matching Sleeve. Imprint Area: 7" W x 4" H Packaging: 50 per carton @ 36 lbs. 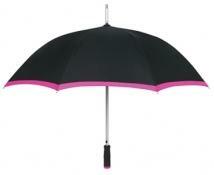 This petite, stylish umbrella is compact in size but not in coverage! Its petite size allows it to conveniently fit in a purse, briefcase or glove compartment. 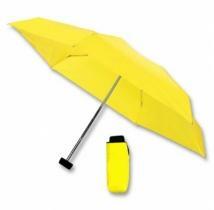 Made of nylon with metal shaft and plastic handle Convenient super-mini size Matching handle and sleeve 8-panel design. Size: Arc Size: 43; Spread: 38; Closed: 9-1/2L Standard Print Area: Panel, 6W x 6H Optional Print Area: Each panel, 6W x 6H Other decorating methods are available for this item, please call. Packaging: Bulk Package Quantity: 60 Package Weight: 43 lbs. 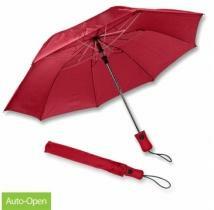 Manual open, mini fold umbrella, Matching plastic handle, Deleon fabric with matching sleeve, Folds down to 9" when closed, Flat fold design, Economical, great for the budget minded. Size: 42" arc. 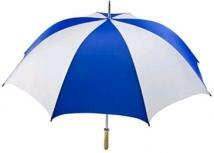 Material Fabric: Decon Polyester Shaft: Steel Handle: Matching Plastic Cover: Standard Auto/Manual: Manual. Dimensions : 9 1/4" L x 2 1/4" W x 1 1/2" H. Shipping Information Carton size: 20 1/2" x 10 1/4" x 6 1/4" Carton pack: 50 units Carton weight: 26.4 lbs. Manual open Steel shaft Genuine wood handle Polyester Fabric Matching sleeve Dimensions: Folded length: 10.5" Arc: 43" Max imprint area: 7"W x 6"H Base prices are listed. Automatic open Steel shaft Genuine wood handle Polyester Fabric Matching sleeve Dimensions: Folded length: 15" Arc: 43" Max imprint area: 7"W x 6.5"H Base prices are listed. 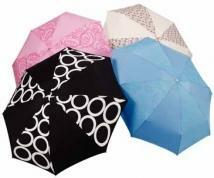 Folding 5-section polyester umbrella 37" arc. Plastic handle Aluminum frame Wrist strap Matching color carrying sleeve with lining inside. Decorating Dimensions: 1"W x 7/16"H per side available on bottom or either side of handle - please specify location. Shipping Information Packed: 48 Per Box Actual Weight: 20 lbs. Dim Weight: 20 lbs. Box Size: 23 x 11 x 7. Automatic Open Metal Shaft With Wood Handle Closed 33". Imprint Area: 7" W x 5" H Packaging: 25 per carton @ 23 lbs. 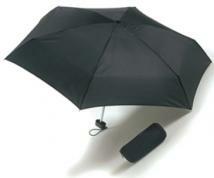 43" Arc Super-mini Telescopic Folding Umbrella. Matching Sleeve. all with Matching Sleeve and Black Handle. Imprint Area: 7" W x 4" H Multi-Panel Imprint: Add $.50 per extra color, per panel, per piece. Packaging: 50 per carton @ 32 lbs. Pongee Material Matching Sleeve And Silver Handle. Imprint Area: 7" W x 4" H. Packaging: 50 per carton @ 33 lbs. 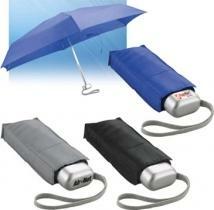 Telescopic Folding Umbrella Matching Sleeve And Handle Pongee Material. Imprint Area: 7" W x 4" H Packaging: 50 per carton @ 22 lbs. The Club's attractive, two-color design will beautifully display any logo while its auto open feature provides added convenience when your customers need it most. Made of nylon with EVA grip handle and metal frame Auto open. 8-panel design. Size: Arc Size: 48"; Spread: 41"; Closed: 31"L Standard Print Area: Panel, 6W x 4H Optional Print Area: Each panel, 6W x 4H. Other decorating methods are available for this item, please call. Packaging: Bulk Package Quantity: 48 Package Weight: 37 lbs. 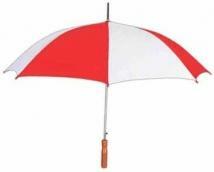 Umbrella with aluminum shaft and plastic case. 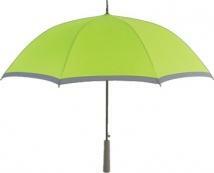 Size : Umbrella - 36" dia. 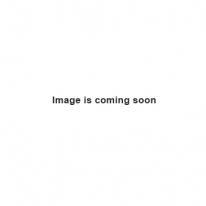 when open Arch - 42" Case - 9" x 2 3/4" x 1 3/4"
Metal Shaft With Wood Handle Closed 40". Imprint Area: 10" W x 6" H Packaging: 25 per carton @ 35 lbs. 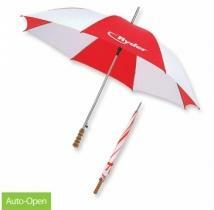 Automatic Open Metal Shaft With Comfort Grip Handle Nylon Material. Size: 46" Arc. Imprint Area: 7" W x 5 1/2" H Packaging: 25 per carton @ 20 lbs. 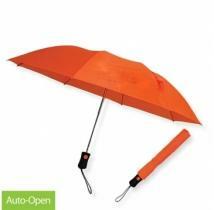 Design With Vented Windproof Canopy Construction Metal Shaft with Wood Handle and Built-In Push Button For Automatic Opening. Matching Nylon Sleeve. Size : 44"arc Imprint Area: 7" W x 5" H. Packaging: 50 per carton @ 36 lbs. 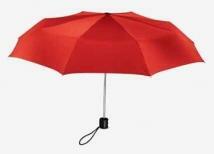 Manual Umbrella Opens To 37" Arc And Folds to 6" Metal Shaft. Available Colors: Lime Green, Red, Orange, Purple, Royal Blue or Yellow, all with Black Case and Matching Colored Zipper. Black with Black Case and Gray Zipper. Approximate Size: Case: 63/4" W x 3" H Imprint Area: Case: 2 1/2"W x 1 1/4"H Packaging: 50 per carton @ 31 lbs. Simple dandelion design floats airily across two panels. 44" arc, folds to 15". Metal shaft, plastic handle. Auto open. Open/Close Method: Auto-Open. Product Weight: 10 lbs. per 12. Striking hibiscus design adorns one panel. 44" arc, folds to 15". Meta shaft, plastic handle. Auto open. Open/Close Method: Auto-Open Product Weight: 10 lbs. per 12. Bubbly polka dot pattern. 44" arc, folds to 15" Metal shaft, plastic handle. Auto open. Open/Close Method: Auto-Open Product Weight: 10 lbs. per 12. 44" arc, folds to 15" Metal shaft, plastic handle with carrying strap Auto open. Open/Close Method: Auto-Open Pagacking: Vinyl Sleeve, Bulk Product Weight: 10 lbs. per 12. The Revolution! 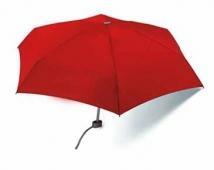 42" arc auto open, folding umbrella with new Wind Reflex frame, If umbrella inverts, it will come back without damaging the frame of the umbrella, Many colors to chose from, Matching plastic handle and nylon cover, Folds down to 15.5" in length, Used by Hospitals, Banks, and Insurance companies, Also a great item for the travel industry. Size : 42" arc. 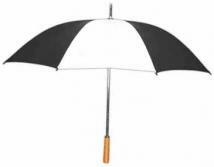 Material Fabric: Nylon Shaft: Steel Handle: Matching Rubberized Cover: Standard Auto/Manual: Auto. Dimensions : 15 3/4" L x 2" W x 2" H. Shipping Information Carton size: 16" x 16 1/2" x 9" Carton pack: 50 units Carton weight: 40.7 lbs. 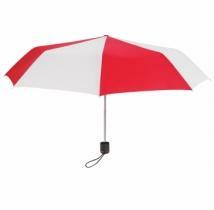 Imprint area : 7" w x 5" h.
Micro Mini Umbrella With Matching Sleeve Manual Umbrella Opens To 38" Arc And Folds To 6" Compact Size Makes It Easy To Fit In Most Briefcases, Handbags, Or Even A Coat Pocket. Case Color: Silver. Imprint Area: Case: 2" W x 1" H Packaging: Gift Box, 25 per carton @ 17 lbs. 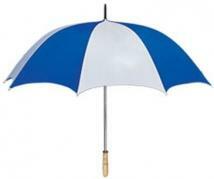 48" arc sport umbrella, Automatic open feature and steel shaft, Straight wood handle, 10mm shaft for durability. Size : 48" arc. 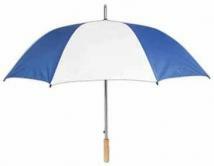 Material Fabric: Nylon Shaft: Steel Handle: Straight wood Cover: Standard Auto/Manual: Auto. Dimensions : 33 3/4" L x 1 1/4" W x 1 1/4" H. Shipping Information Carton size: 34 5/8" x 11 1/4" x 8 3/8" Carton pack: 48 units Carton weight: 45 lbs. 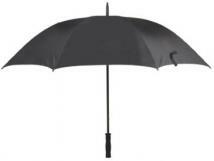 40" arc, 3-section shaft, manual open Closed: approximately 9 1/2" in length Steel shaft and ribs Black plastic handle 100% polyester canopy and case 8 panels. Max. Imprint Area: 8" bottom width x 4" height x 6" top width. Case Pack/Ship Weight: 36 pcs. - 29 lbs. 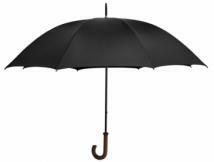 42" arc, 2-section shaft, automatic open Closed: approximately 15 1/2" in length Steel shaft and ribs Handle: 3-fingered black plastic 100% polyester canopy and case (case on solid colors only). Panels: 8. Max. Imprint Area: 8" bottom width x 7" height x 5" top width. Case Pack/Ship Weight: 25 pcs. - 20 lbs. 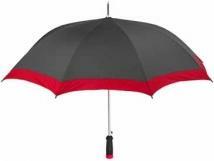 Folding 5-section polyester umbrella 37" arc Plastic handle Aluminum frame Wrist strap Deluxe zippered carrying case with matching trim. 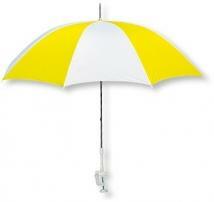 Decorating Dimensions: Umbrella handle: 1"W x 7/16"H per side. Carrying Case: 4"W x 1-1/4"H Shipping Information Packed: 48 Per Box Actual Weight: 25 lbs. Dim Weight: 25 lbs. Box Size: 25 x 13 x 8. 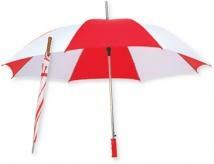 Stay protected in style, Features : durable fabric, 2-tone design and wooden handle. Imprint Area: 9� x 6� Product Size: 52� diameter 29� arch WT/PC: 51 lbs./36 units (master carton) Packaging: Individually sleeve and polybagged. 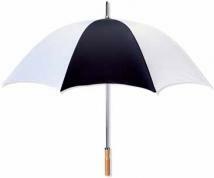 60" arc economy golf umbrella, Steel shaft and double steel ribs, Straight wood handle, Wind proof feature for extra durability in high winds, A super value. Size: 60" arc. 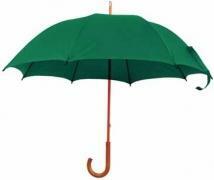 Material Fabric: Nylon Shaft: Steel Handle: Wood Cover: Standard Auto/Manual: Manual. Dimensions : 41" L x 1 3/4" W x 1 3/4" H. Shipping Information Carton size: 41" x 8" x 6 1/2" Carton pack: 25 units Carton weight: 33 lbs. 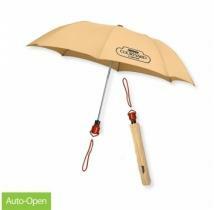 Imprint area : 11" W x 7" H.
43" arc auto open folding umbrella with wood handle and ferule, Nylon sleeve is included, High perceived value! 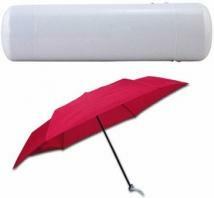 Folds down to 16" in length, Available in various colors. Size: 43" arc. 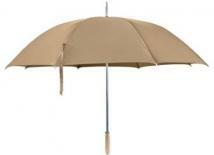 Material Fabric: Nylon Shaft: Steel Handle: Wood Cover: Standard Auto/Manual: Auto. Dimensions : 16 1/2" L x 1 3/4" W x 1 3/4" H. Shipping Information Carton size: 17 3/4" x 8" x 17" Carton pack: 50 units Carton weight: 46.2 lbs. Fiberglass Shaft. Imprint Area: 9" W x 5" H Packaging: 20 per carton @ 30 lbs. Automatic Open Aluminum Frame Comfort Grip Handle Polyester Material 32.5\" Closed Imprint Area: 7\" W x 4 1/2\" H Packaging: 25 per carton @ 24 lbs. 60" arc. Double ribbed frame for strength. Metal shaft with wood handle. Open/Close Method: Manual. Packacking: Bulk Product Weight: 13 lbs. per 12. 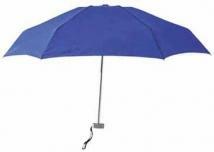 A metal shaft and wooden handle make the Eagle budget-friendly while its extra-large size canopy protects from the elements. 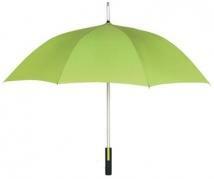 Made of nylon with metal shaft and wooden handle 8-panel design. Size: Arc Size: 60; Spread: 52; Closed: 41L Standard Print Area: Panel, 9W x 7H Optional Print Area: Each panel, 9W x 7H Other decorating methods are available for this item, please call. Packaging: Bulk Package Quantity: 24 Package Weight: 30 lbs. 42" arc, folds to 12". Deluxe pongee fabric. Aluminum shaft with soft, curved handle styling. Matching fabric sleeve. Open/Close Method: Manual Packaging: Fabric Sleeve, Bulk Product Weight: 6 lbs. per 12. 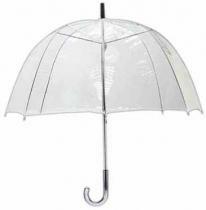 Our Largest Folding Automatic Umbrella Fiberglass And Metal Frame With Metal Ultra Sturdy Hexagonal Shaft. Long Tapered Wood Handle With Built-In Push Button For Automatic Opening Matching Nylon Sleeve. Color: Solid: Black or Navy with Matching Sleeve and Black Handle. Two-Tone: Royal Blue/White with Royal Blue Sleeve and Black Handle. Imprint Area: 9" W x 5" H Packaging: 20 per carton @ 29 lbs. Automatic Open Pongee Material Matching Sling Strap Can Be Worn Over Shoulder Metal Shaft With Rubberized Handle. Imprint Area: 7" W x 4 1/2" H Packaging: 25 per carton @ 28 lbs. 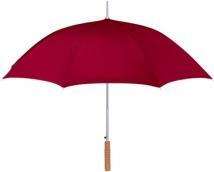 Storm Budget Buster - Automatic open umbrella with genuine wood handle, 58" arc. 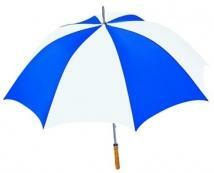 Budget Buster, Storm umbrella offers a genuine wood handle. Automatically opens with a push of a button. 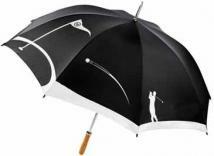 Features a 58" arc, steel shaft, polyester fabric, and matching sleeve. Folded length is 37.5". Material: Polyester Size: 58". 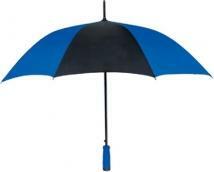 42" arc auto open folding umbrella with vented technology Rubberized handle for secure grip in high winds. Size: 42" arc. 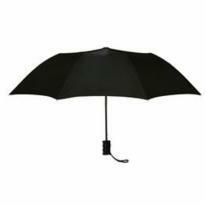 Material Fabric: Nylon Shaft: Steel Handle: Black Rubber Cover: Vented Auto/Manual: Auto. Dimensions : 16" L x 1 3/4" W x 1 3/4" H. Shipping Information Carton size: 17" x 17" x 9 1/2" Carton pack: 50 units Carton weight: 41.14 lbs. Manual open Steel wind resistant frame with fiberglass ribs Clear POE fabric Colored handle, with matching ferule, tips, and trim Pinch-proof runner to protect fingers Dimensions: length: 34" Arc: 48" Max. Imprint Area: 7"W X 6"H Shipping Weight per 36 pcs: 37 lbs. 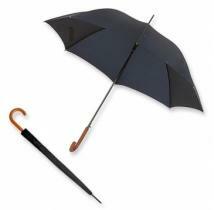 Always be prepared, Features : high quality umbrella, metal shaft, compact case. 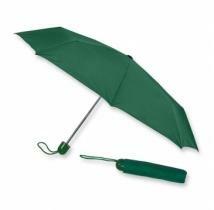 Size : 35"w Imprint Area: (case) 4 1/2� x 1 1/2� (umbrella) 7� x 4� Product Size: (case) 4 1/2� x 2 1/2� (umbrella) 35� diameter 19� arch WT/PC: 27 lbs./48 units (master carton) Packaging: Individually sleeve and polybagged. Unique design allows you to put your logo on the panel of your choice (flag, ball, or golfer panels). Classic golf swing pose captured as ball travels across three panels 60" Arc. Metal shaft, wooden handle. Open/Close Method: Manual Product Weight: 13 lbs. per 12. 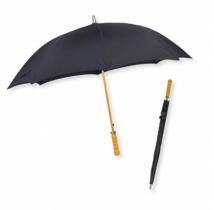 The Executive's curved wooden handle adds a touch of sophistication while durable pongee material and a sturdy metal shaft allow it to weather any storm. 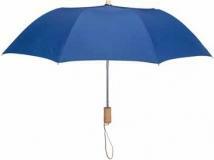 Made of pongee material with metal shaft and wooden handle. 10-panel design. Size: Arc Size: 46; Spread: 40; Closed: 20L Standard Print Area: Panel, 6W x 6H Optional Print Area: Each panel, 6W x 6H Other decorating methods are available for this item, please call. Packaging: Bulk Package Quantity: 48 Package Weight: 58 lbs. 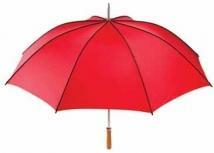 48" arc fashion style umbrella with wood shaft and wood hook handle, Classic look, Nylon fabric. Size: 48" arc. Material Fabric: Nylon Shaft: Wood Handle: Wood Hook Cover: Standard Auto/Manual: Manual. Dimensions : 34 1/4" L x 4 3/4" W x 1 3/4" H. Shipping Information Carton size: 40" x 7" x 15 1/2" Carton pack: 48 units Carton weight: 48 lbs. Imprint area : 7" W x 5" H.
Automatic open & close Steel shaft Ergonomic black handle Nylon Fabric Windproof Frame Matching sleeve Dimensions: Folded length: 15" Arc: 42" Max imprint area: 7"W x 6.5"H Base prices are listed. 39" arc, folds to 6.5" Deluxe pongee fabric Compact styling with big coverage Coordinating EVA carrying case Aluminum shaft, plastic handle. Open/Close Method: Auto-Open Packaging: Fabric Sleeve, Bulk Product Weight: 7 lbs. per 12. 60" arc. Stylish contrasting piping adds a simple flair. Double ribbed frame for strength. Metal shaft with wood handle. Open/Close Method: Manual Product Weight: 13 lbs. per 12. 48" arc clamp on chair umbrella, Great Beach item, Plastic clamp fits most chairs, flexible shaft allows perfect positioning, Super for Hotels and Beach Events, Great POP item as well. Size: 48" arc. 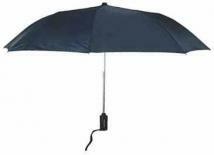 Material Fabric: Nylon Shaft: Steel Handle: N/A Cover: Standard Auto/Manual: Manual. Dimensions : 37 1/2" L x 1 1/2" W x 1 1/2" H. Shipping Information Carton size: 38" x 14" x 8" Carton pack: 48 units Carton weight: 45 lbs. 40-inch arc (101.6cm), 3-section shaft, manual open Closed: approximately 10.25 inches (26 cm) in length 3M Scotchlite reflective trim on canopy Steel shaft and ribs. Ergonomic rubber coated sport grip handle with metallic trim. Panels: 6. Max. Imprint Area: 10" W Bottom x 10" W Top x 2.5" H Case Pack/Ship Weight: 36 pcs. - 24 lbs. 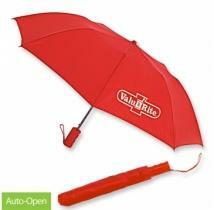 A single white panel will make your logo stand out on this high-quality umbrella. A fiberglass shaft and PVC handle ensure a long-lasting promotion. Made of nylon with fiberglass shaft and PVC handle White panel draws maximum attention to your logo Push-button automatic open 8-panel design. Size: Arc Size: 55 Spread; 46; Closed: 39L Standard Print Area: White panel, 8W x 6H Optional Print Area: Each colored panel, 8W x 6H Other decorating methods are available for this item, please call. Packaging: Bulk. Package Quantity: 48 Package Weight: 52 lbs. 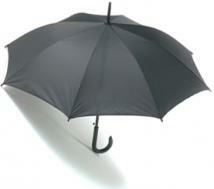 60" arc large doorman style umbrella with painted black steel shaft and solid wood hook handle. 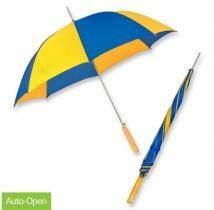 42" arc, folds to 11" Stylish pongee fabric Auto open / auto close Metal shaft, plastic handle. Packaging: Bulk Product Weight: 13 lbs. per 12.